Seats won in the election (outer ring) against number of votes (inner ring). The 2001 United Kingdom general election was held on Thursday 7 June 2001, four years after the previous election on 1 May 1997, to elect 659 members to the House of Commons. Under the leadership of Tony Blair, the Labour Party was re-elected to serve a second term in government with another landslide victory, returning 413 of the 418 seats won by the party in the previous general election, a net loss of 5 seats, though with a significantly lower turnout than before—59.4%, compared to 71.3% at the previous election. Blair went on to become the first Labour Prime Minister to serve a consecutive full term in office. It was dubbed "the quiet landslide" by the media. There was little change outside Northern Ireland, with 620 out of the 641 seats electing candidates from the same party as they did in 1997. Factors contributing to the Labour victory were a strong economy and falling unemployment, as well as the fact that the Labour government was seen as having delivered on many key election pledges that it had made in 1997. The Conservative Party, under William Hague's leadership, was still deeply divided on the issue of Europe and the party's policy platform was considered to have shifted to a right-wing focus. Hague was also hindered by a series of embarrassing publicity stunts, and resigned as party leader three months later, becoming the first Leader of the Conservative or Unionist party in the House of Commons since Austen Chamberlain to not serve as Prime Minister. The election was essentially a repeat of the 1997 general election, with Labour losing only 6 seats overall and the Conservatives making a net gain of one seat (gaining nine seats, but losing eight). The Conservatives did manage to gain a seat in Scotland, which ended the party's status as an 'England-only' party in the prior parliament, but once again were left unrepresented in Wales. Although they did not gain many seats, two of the few new MPs elected were future Conservative Prime Minister David Cameron and future Conservative Chancellor of the Exchequer, George Osborne; who would serve in the same Cabinet as Cameron from 2010-16. The Liberal Democrats gained six seats. The 2001 general election is the last to date in which any government has held an overall majority of more than 100 seats in the House of Commons, and one of only two since the Second World War (the other being 1997) in which a single party won over 400 MPs. It was also the last election at which Labour secured over 40% of the popular vote until the snap 2017 general election, held exactly sixteen years and one day later. Change was seen in Northern Ireland, with the moderately unionist Ulster Unionist Party losing four seats to the more hardline Democratic Unionist Party. This transition was mirrored in the nationalist community with the moderate SDLP losing votes to the more staunchly republican and abstentionist Sinn Féin. The election was also marked by exceptionally low voter turnout, falling below 60% for the first (and so far, only) time since 1918. The election was broadcast live on the BBC, and presented by Jeremy Paxman, Andrew Marr, Peter Snow and David Dimbleby. The 2001 general election was notable for being the first in which pictures of the party logos appeared on the ballot paper. Prior to this, the ballot paper had only displayed the candidate's name, address and party name. The election had been expected on 3 May, to coincide with local elections, but both were postponed because of rural movement restrictions imposed in response to the foot and mouth outbreak. The elections were marked by voter apathy, with turnout falling to 59.4%, the lowest since the Coupon Election of 1918. Throughout the election the Labour Party had maintained a significant lead in the opinion polls and the result was deemed to be so certain that some bookmakers paid out for a Labour majority before the election day. However, the opinion polls the previous autumn had shown the first Tory lead (though only by a narrow margin) in the opinion polls for eight years as they benefited from the public anger towards the government over the fuel protests which had led to a severe shortage of motor fuel. By the end of 2000, however, the dispute had been solved and Labour were firmly back in the lead of the opinion polls. In total, a mere 29 parliamentary seats changed hands at the 2001 Election. One of the more noted events of a quiet campaign was when countryside protester Craig Evans threw an egg at Deputy Prime Minister John Prescott in Rhyl; Prescott then punched him and a struggle ensued, in front of television cameras. 2001 also saw the rare election of an independent. Dr. Richard Taylor of Independent Kidderminster Hospital and Health Concern (usually now known simply as "Health Concern") unseated a government minister. There was also a high vote for British National Party leader Nick Griffin in Oldham, in the wake of recent race riots in the town. In Northern Ireland, the election was far more dramatic and marked a move by unionists away from support for the Good Friday Agreement, with the moderate unionist Ulster Unionist Party (UUP) losing to the more hardline Democratic Unionist Party (DUP). This polarisation was also seen in the nationalist community, with the Social Democratic and Labour Party (SDLP) vote losing out to more left-wing and republican Sinn Féin. It also saw a tightening of the parties as the small UK Unionist Party lost its only seat. For Labour, the last four years had run relatively smoothly. The party had successfully defended all their by election seats, and many suspected a Labour win was inevitable from the start. Many in the party however were afraid of voter apathy, which was epitomised in the "Hague with Lady Thatcher's hair" poster. Despite recessions in mainland Europe and the United States, due to the bursting of global tech bubbles, Britain was notably unaffected and Labour however could rely on a strong economy as unemployment continued to decline toward election day, putting to rest any fears of a Labour government putting the economic situation at risk. For William Hague, however, the Conservative Party had still not fully recovered from the loss in 1997. The party was still divided over Europe, and talk of a referendum on joining the Eurozone was rife. As Labour remained at the political centre, the Tories moved to the right. A policy gaffe by Oliver Letwin over public spending cuts left the party with an own goal that Labour soon took advantage of. Margaret Thatcher also added to Hague's troubles when speaking out strongly against the Euro to applause. Hague himself, although a witty performer at PMQs, was dogged in the press and reminded of his speech at Conservative conference at the age of 16. 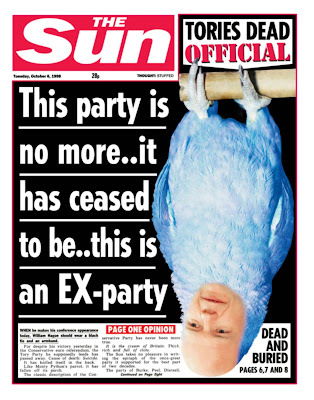 The Sun newspaper only added to the Conservatives woes by backing Labour once again, calling Hague a "dead parrot" during the Conservative Party's conference in October 1998. The Tories campaigned on a strongly right-wing platform, emphasising the issues of Europe, immigration and tax, the fabled "Tebbit Trinity". However, Labour countered by asking where the proposed tax cuts were going to come from, and decried the Tory policy as "cut here, cut there, cut everywhere", in reference to the widespread belief that the Conservatives would make major cuts to public services in order to fund tax cuts. For the Liberal Democrats, this was the first election for leader Charles Kennedy. During the election Sharron Storer, a resident of Birmingham, criticised Prime Minister Tony Blair in front of television cameras about conditions in the National Health Service. The widely televised incident happened on 16 May during a campaign visit by Blair to the Queen Elizabeth Hospital in Birmingham. Sharron Storer's partner, Keith Sedgewick, a cancer patient with non-Hodgkin's lymphoma and therefore highly susceptible to infection, was being treated at the time in the bone marrow unit, but no bed could be found for him and he was transferred to the casualty unit for his first 24 hours. The election result was effectively a repeat of 1997, as the Labour Party retained an overwhelming majority with BBC announcing the victory at 02:58 on the early morning of the 8th June. Having presided over relatively serene political, economic and social conditions, the feeling of prosperity in the United Kingdom had been maintained into the new millennium, and Labour would have a free hand to assert its ideals in the subsequent parliament. Despite the victory, voter apathy was a major issue, as turnout fell below 60%, 12% down on 1997. All of the 3 main parties saw their total votes fall, with Labour's total vote dropping by 2.8 million on 1997, the Conservatives 1.3 million, and the Liberal Democrats 428,000. Some suggested this dramatic fall was a sign of the general acceptance of the status quo and the likelihood of Labour's majority remaining unassailable. For the Conservatives, this huge loss they had sustained in 1997 was repeated. Despite gaining 9 seats the Tories lost 7 to the Liberal Democrats, and one even to Labour. The inevitable result was the speedy resignation of William Hague in the election aftermath resigning at 07:44 outside the Conservative Party headquarters. Some believed that Hague had been unlucky, although most considered him to be a talented orator and an intelligent statesman, he had come up against the charismatic Tony Blair in the peak of his political career, and it was no surprise that little progress was made in reducing Labour's majority after a relatively smooth parliament. Staying at what they considered rock bottom however showed that the Conservatives had failed to improve their negative public image, had remained somewhat disunited over Europe and had not regained the trust that they had lost in the 1990s. But in Scotland, despite gaining one seat from the SNP, their vote collapse continued. They failed to retake former strongholds in Scotland as the Nationalists consolidated their grip on the Northeastern portion of the country. The Liberal Democrats could point to steady progress under Charles Kennedy, gaining more seats than the main two parties – albeit only six overall – and maintaining the performance of a pleasing 1997 election, where the party had doubled its number of seats from 20 to 46. While they had yet to become electable as a government, they underlined their growing reputation as a worthwhile alternative to Labour and Conservative, offering plenty of debate in parliament and not just representing a protest vote. The SNP failed to gain any seats and lost a seat to the Conservatives by just 79 votes. Plaid Cymru both gained a seat from Labour and lost one to them. In Northern Ireland the Ulster Unionists, despite gaining North Down, lost 5 other seats. All parties with more than 500 votes shown. Romsey from Conservative to Liberal Democrats. This seat stayed Liberal Democrat in 2001. South Antrim from Ulster Unionists to Democratic Unionists. This seat reverted to the Ulster Unionists in 2001. The results of the election give a Gallagher index of dis-proportionality of 17.74. The disproportionality of the house of parliament in the 2001 election was 18.03 according to the Gallagher Index, mainly between Labour and the Liberal Democrats. ^ Parkinson, Justin (3 August 2010). "The rise and fall of New Labour". BBC News. Retrieved 12 May 2015. ^ Audickas, Lukas; Cracknell, Richard (13 December 2018). "UK Election Statistics: 1918–2018: 100 Years of Elections" (PDF). Briefing Paper Number CBP7529. House of Commons Library. p. 25. Retrieved 1 April 2019. ^ Overs, Jeff (1 June 2001). "General Election 2001 postal vote ballot paper voting slip". BBC News & Current Affairs. 466659381. Retrieved 1 April 2019 – via Getty Images. ^ "Tories 'to cut fuel duty'". BBC News. 10 May 2001. Retrieved 26 October 2015. ^ "2001: Labour claims second term". BBC News. 5 April 2005. Retrieved 26 May 2010. ^ "'Get out and vote. Or they get in.' – Election 2001". The Guardian. London. Archived from the original on 20 April 2017. ^ "Sun prints Tories' obituary". BBC News Online. London. 7 October 1998. Retrieved 1 April 2019. ^ McElvoy, Anne (7 October 1998). "Hague's parrot is not dead, he's just resting – with the odd squawk". The Independent. London. Retrieved 1 April 2019. ^ "2001: Labour claims second term". BBC News. 5 April 2005. ^ Duncan Watts (2006). British Government and Politics: A Comparative Guide. Edinburgh University. ISBN 978-0-7486-2323-5. ^ "BBC NEWS – VOTE2001 – Ambush upset Blair's day". ^ "BBC NEWS – VOTE2001 – Cancer patient's partner confronts Blair". ^ "The poll that never was". BBC News. 11 June 2001. ^ "Labour romps home again". BBC News. 8 June 2001. ^ Morgan, Bryn (18 June 2001). "General Election Results, 7 June 2001 [Revised Edition]" (PDF). Research Paper 01/54. House of Commons Library. p. 11. Retrieved 1 April 2019. Morgan, Bryn (18 June 2001). "General Election Results, 7 June 2001 [Revised Edition]" (PDF). Research Paper 01/54. House of Commons Library. BBC News: Vote 2001 – in depth coverage. Catalogue of 2001 general election ephemera at the Archives Division of the London School of Economics.